Administration and regulation, namely the licensing and discipline of insurance agents, brokers and adjusters in the Province of Manitoba; establishing standards of professionalism, competence and integrity in the insurance industry; conducting investigations and adjudicating complaints. Stationary, namely writing paper and envelopes. Office supplies, namely business cards. Periodic publication of council reports, bulletins and annual report. Administration supplies, namely forms for applications for licensing, disclosure statements and complaints. 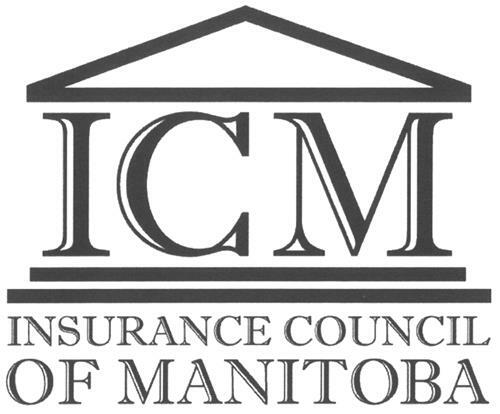 On Tuesday, November 25, 2008, a canadian trademark registration was filed for the above pictured logo by INSURANCE COUNCIL OF MANITOBA 466-167 Lombard Avenue, Winnipeg, MANITOBA, CANADA R3B0T6. The Canadian IP office has given the trademark application number of 1420291. The current status of this trademark filing is Registration published. The correspondent listed for is ROGER D. GRIPP of (D'ARCY & DEACON LLP), 2200 - ONE LOMBARD PLACE, WINNIPEG, MANITOBA, CANADA R3B0X7 The trademark is filed in the description of Administration and regulation, namely the licensing and discipline of insurance agents, brokers and adjusters in the Province of Manitoba; establishing standards of professionalism, competence and integrity in the insurance industry; conducting investigations and adjudicating complaints. , Stationary, namely writing paper and envelopes. , Office supplies, namely business cards. , Periodic publication of council reports, bulletins and annual report. , Administration supplies, namely forms for applications for licensing, disclosure statements and complaints. , Promotional and informational pamphlets, brochures, flyers and posters. , Educational publications, namely continuing education course materials, booklets and power point presentations. , Periodic publications, namely council reports, bulletins and annual report. .
Mark Disclaimer: The right to the exclusive use of the words INSURANCE COUNCIL OF MANITOBA is disclaimed apart from the trade-mark. (1) - Administration and regulation, namely the licensing and discipline of insurance agents, brokers and adjusters in the Province of Manitoba; establishing standards of professionalism, competence and integrity in the insurance industry; conducting investigations and adjudicating complaints. (2) - Stationary, namely writing paper and envelopes. (3) - Office supplies, namely business cards. (4) - Periodic publication of council reports, bulletins and annual report. (5) - Administration supplies, namely forms for applications for licensing, disclosure statements and complaints. (6) - Promotional and informational pamphlets, brochures, flyers and posters. (7) - Educational publications, namely continuing education course materials, booklets and power point presentations. (8) - Periodic publications, namely council reports, bulletins and annual report.